I recently decided I'd give the Mini Exchange program on Astronomican a shot. Simply put a bunch of us forum members over there are painting up minis for eachother, both for the hell of it and to provide us with interesting challenges. More exchange minis coming up soon, starting off with a Tyranid of yet undetermined genus. As well as a Snakebit Voodoo Ork Doc based on an old Rogue Trader mini! So, did you convert that up and paint it? Or just paint it? Both the conversion work and the painting are good, I just don't want to credit you for both if it's not your work. :) I like the battle damage on the marine, and the green "snout". 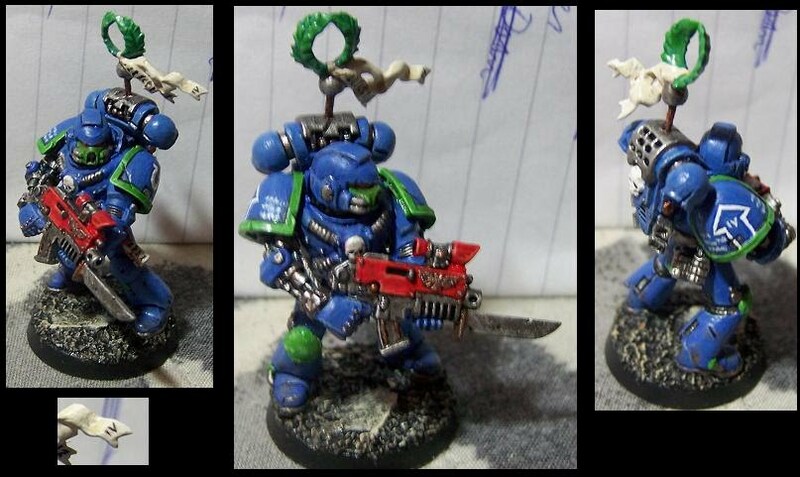 I've not seen someone paint their marines that way before... it has character. Aye, conversion and paintjob are both mine for a buddy who loves 4th company. I know the snout thing is a bit unusual, has worked wonders for me over the year by adding some variation to squads that would otherwise be rather uniform.